Something magical happened at Nordstrom Rack. When I arrived, they were having a HUGE clearance on Women’s clothing. ADD kicked in and I wanted to resist the urge, but resistance was futile. “I’ll just look.” If I found something, I might get it. I wanted to reward myself for maintaining my size for more than a year now. I’ve fluctuated some, but I’ve maintained a shape-range I’m comfortable with. Browsing wouldn’t hurt. Immediately, I found two lovely cardigans for less than $15 each! My office remains perpetually cold, so cardis are a must. Plus, they are a great layer to add on to almost any thing. While I was browsing, there was a Diane Von Furstenburg dress misplaced in the area where I was looking. The dress was on clearance, but definitely the wrong size and definitely the wrong rack (instead of the shirts, blouses, tops area—I told you it was a giant clearance sale). I went to the dress area and began glancing through each frock, that familiar hanger on metal squeak as you pass each one by. I went through about 50 dresses before going to the second rack. Cobalt blue always attracts my eye. My eye was drawn to the color, the brain wanted to see more. I found it! This one. 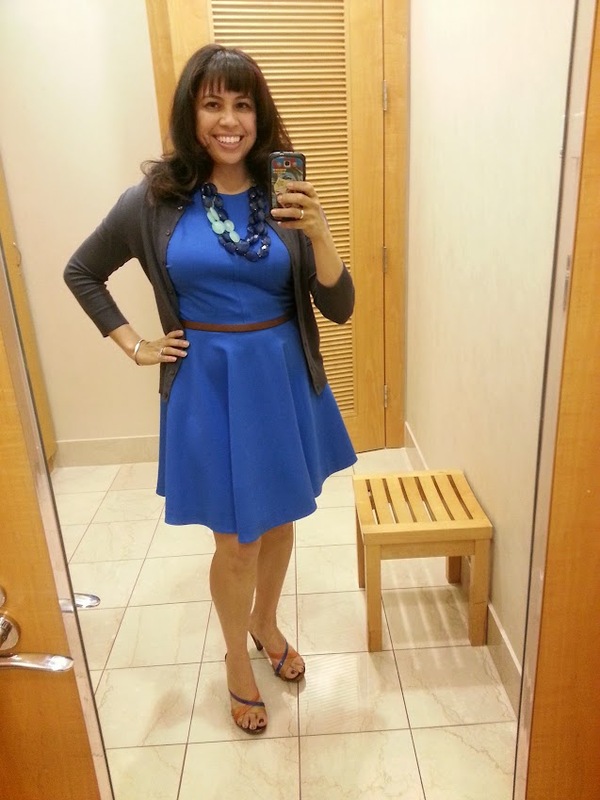 A cobalt DVF dress! This beautiful dress in my size in a price point that justified dipping into my “what if” fund—still less than my normal dress prices. So very many possibilities with this! Even better…IT HAS POCKETS!!! Today, I will call my Abuela and tell her of this dress. Tell her how her words lived inside of me for 30 years, then mail her a photo. It wasn’t about the designer label. It was about the memory. It was about how someone who created something 30 years ago made my grandmother feel, makes me feel the same way. That’s timeless. Truly words have power and can lay dormant for years before they emerge. Grateful for my grandmother’s words. *and yes, I did find a replacement pair of sneakers for my little one. She was even more excited about this pair.